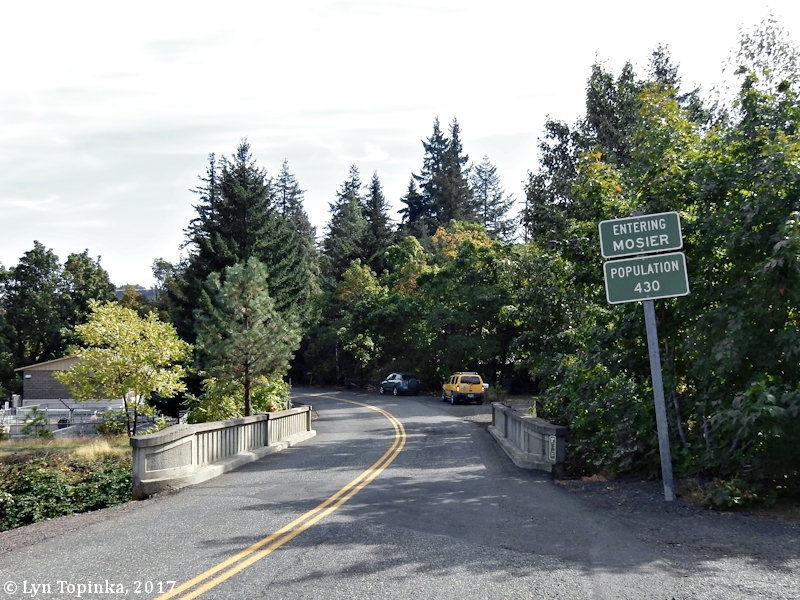 "Mosier and Mosier Creek, Oregon"
Click image to enlarge "Welcome to Mosier", Mosier, Oregon. Image taken March 6, 2010. 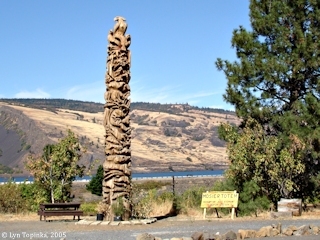 The small community of Mosier is located on the Oregon side of the Columbia River at River Mile (RM) 175, and is located between Rock Creek on the west and Mosier Creek on the east. Five miles downstream is the City of Hood River and fifteen miles upstream is the City of The Dalles. Also located upstream are Tom McCall Nature Preserve, Rowena and Rowena Crest, and Mayer State Park. Today Mosier is well known for being the eastern end of the Twin Tunnels of the Historic Columbia River Highway. Downstream of Mosier are the basalts of the Bingen Gap and upstream are the basalts of Rowena Gap. 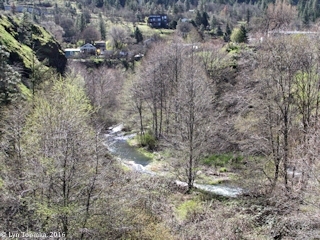 Click image to enlarge Mosier, Oregon, as seen from downstream. View from the Mark O. Hatfield State Trail. Image taken September 18, 2005. 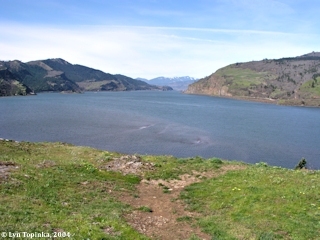 Click image to enlarge Columbia River looking downstream towards Mosier, Oregon. 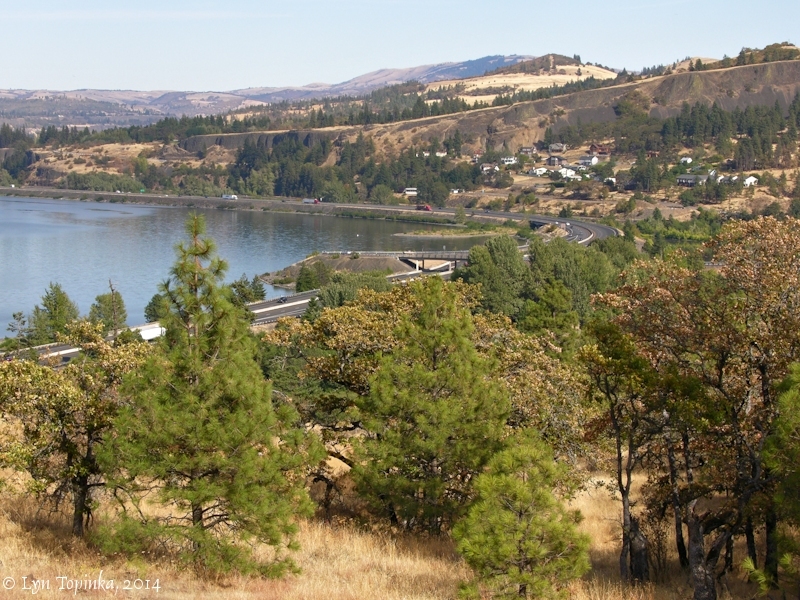 View from along the Historic Columbia River Highway upstream of Mosier, Oregon. Eighteenmile Island can be seen on the left just off the Oregon shore. The location of Mosier, Oregon, is located on the left. The basalts of the Bingen Gap are visible on the right. Image taken March 20, 2004. Rock Creek is located on the west side of Mosier. 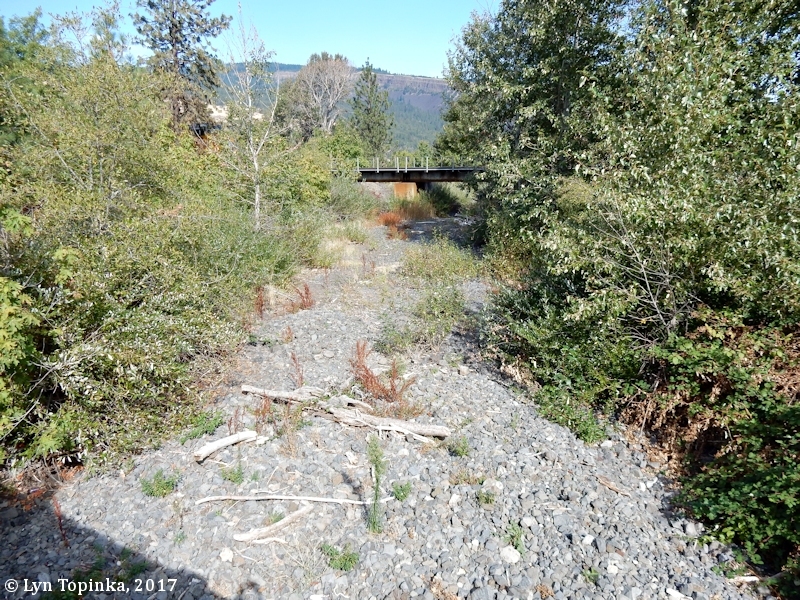 It is an intermittent stream which begins in Hood River County and merges with the Columbia River in Wasco County at approximately Columbia River Mile (RM) 175. 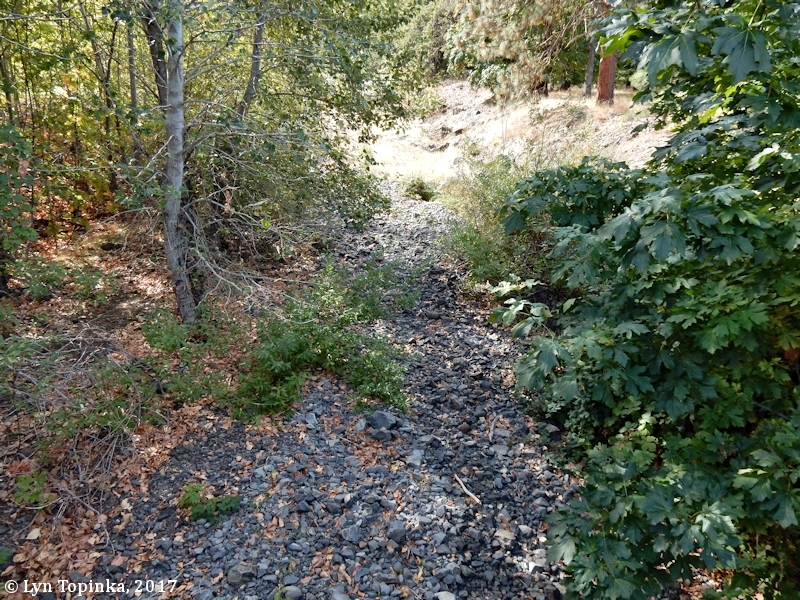 Click image to enlarge Rock Creek, looking upstream, Mosier, Oregon. Image taken October 4, 2017. 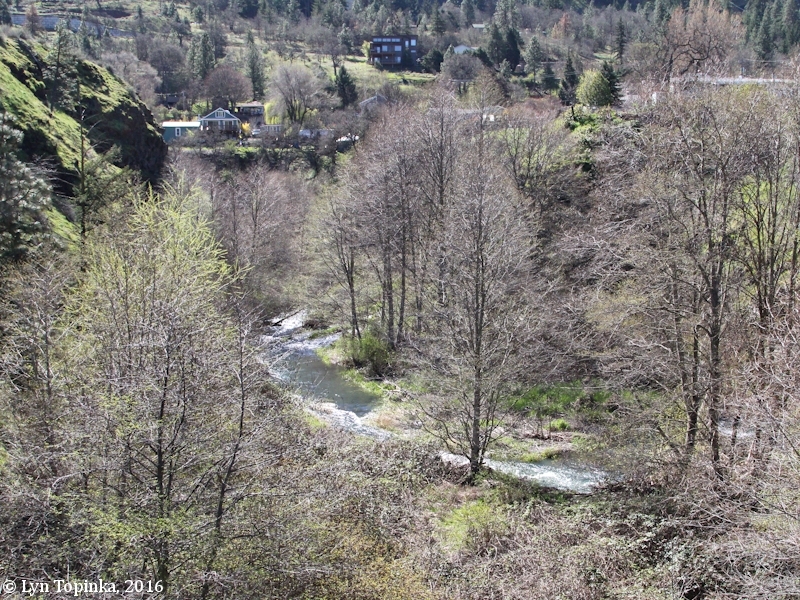 Click image to enlarge Rock Creek, looking downstream, Mosier, Oregon. Image taken October 4, 2017. Mosier Creek is located on the east side of Mosier. Mosier Creek begins approximately 15 miles northeast of Mount Hood and lies within Wasco County. It merges with the Columbia River at RM 175. 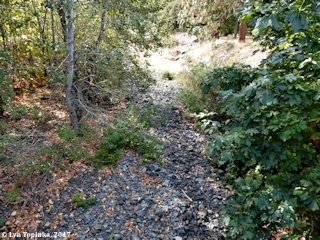 Mosier Creek was at one time known as "East Fork Mosier Creek". 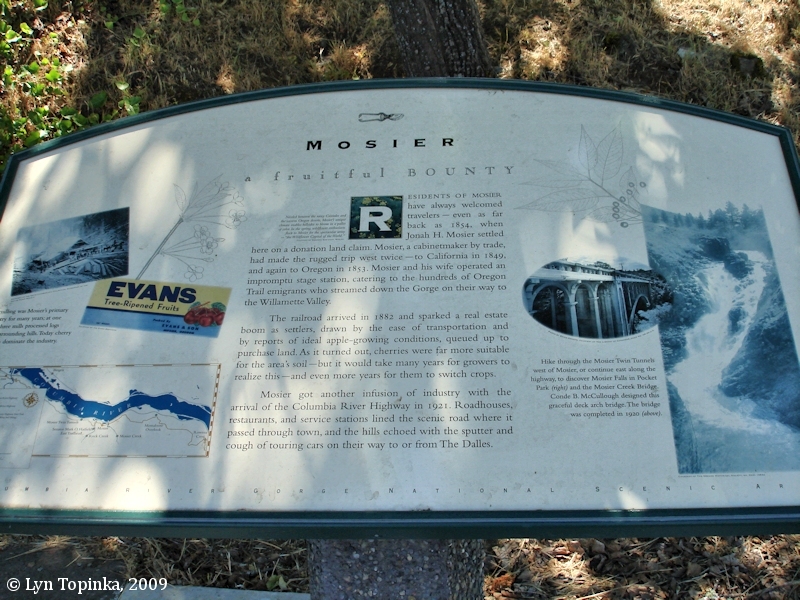 The Board of Geographic Names made "Mosier Creek" official in 1976. Click image to enlarge Mosier Creek, Mosier, Oregon. View upstream from right bank. Image taken March 30, 2016. 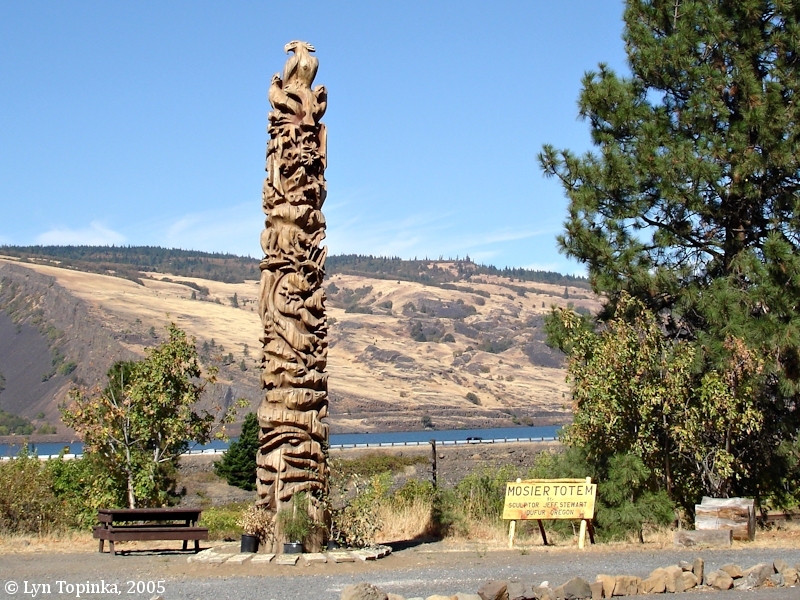 The Wasco County community of Mosier began in 1853 or 1854 when Jonah Harrison Mosier settled on a land claim near the mouth of today's Mosier Creek where he established a succession of sawmills. Jonah Mosier also ran a "rest area" stage station for weary travelers, ran cattle on the plateau, and served as an Oregon legislator. The U.S. Bureau of Land Management, General Land Office Records, show a Jane and Heirs of Jonah H. Mosier being issued a land title on October 15, 1873, for 258.9 acres of parts of T2N R11E Sections 1 and 2 (1850 "Oregon-Donation Act"). Jonah H. Mosier was also issued a land title on July 25, 1892, for 93.53 acres of parts of T2N R11E Section 1 (1820 "Sale-Cash Entry") and on August 14, 1893, for 31.2 acres of parts of T2N R11E (1820 "Sale-Cash Entry"). Jonah Mosier and his first wife Jane had seven children: Sarah Alice, Emily Ann, Mary S., Josephine, Benjamin Franklin, Jefferson, and Lydia. After her death Jonah Mosier remarried and had two children with his second wife Martha: Effie Jane and Dolly. After Jonah's death in 1894 his son Jefferson platted the town of Mosier. In 1896 Jefferson began construction of a grand Queen Anne-style home, today known as the "Mosier House". 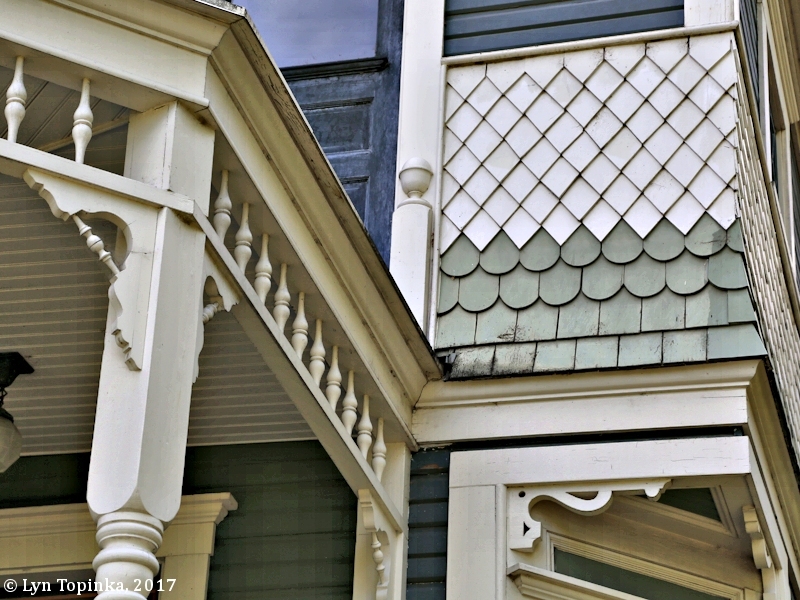 "Jefferson Mosier platted the town in 1902 and named the small community after his father, Jonah Mosier, whose Donation Land Claim of 1855 included the townsite." "In 1854 he [Jonah Mosier] looked around for a location for a sawmill. he took up land here on Mosier creek. Mosier creek and the town of Mosier are both named for my father. ... He built a landing here, which in steamboat days was known as Mosier Landing. ... Father and mother took up six hundred and forty acres here in 1854. The east half section was my fathers, the west my mothers. In 1894, at the time of my father's death, I bought the interest of the other heirs and I platted the town of Mosier. ... The railroad came here in 1882. J.J. Lynch was the first telegraph generator and agent. He built a small building across the track and ran a store, and he was the first postmaster. 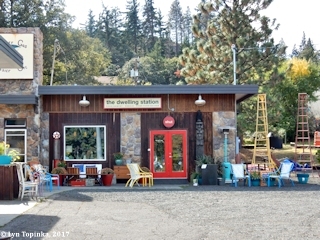 ... "
The Mosier Post Office was established in 1884 and the town was incorporated in 1914. 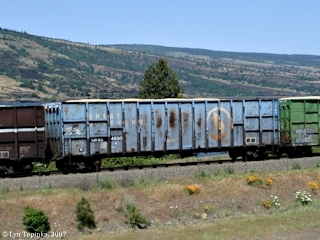 "Twenty-seven acres of ground, immediately back of the Mosier depot has been laid off for a town site. It comprises seventeen blocks with some fractional blocks, in lots 50x100 feet each. The Holmes Mercantile Co., are now constructing a building for the accomodation of a general merchandise store. A fruit dryer will be erected by the same company in time to handle the present season's fruit. The Holmes company expect to be ready for business by the first of June." Source: "The Dalles Daily Chronicle", May 24, 1892, courtesy Historic Oregon Newspapers Archives, University of Oregon Libraries, 2017. The town never truly recovered, the population dwindling from 500 in 1919 to 250 in 1921. 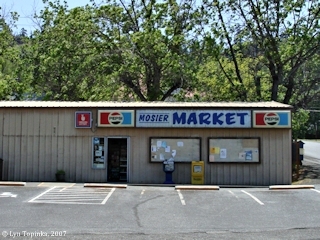 Throughout the years, Mosier has maintained a stabile population and its current population listed at 340 (1990). 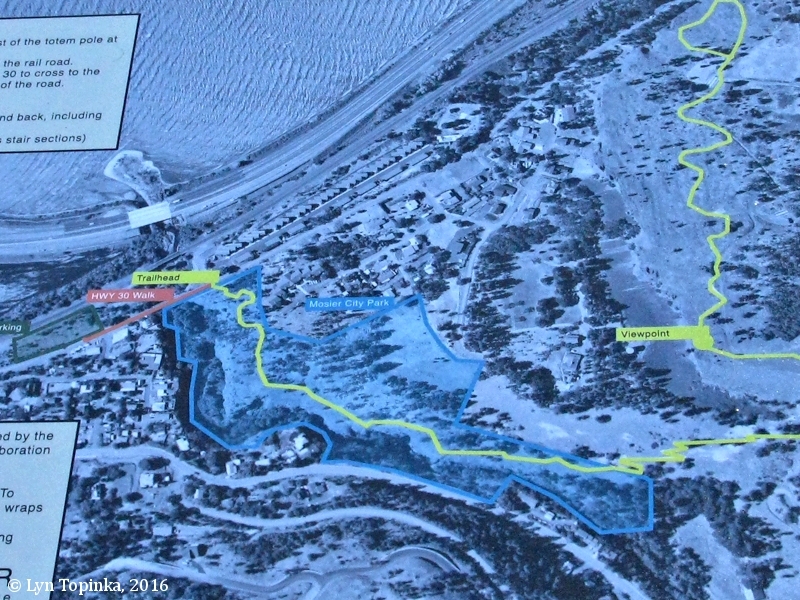 The area is still an important fruit porducing area and in recent years has benefitted from the influx of sail boarders and associated industries." 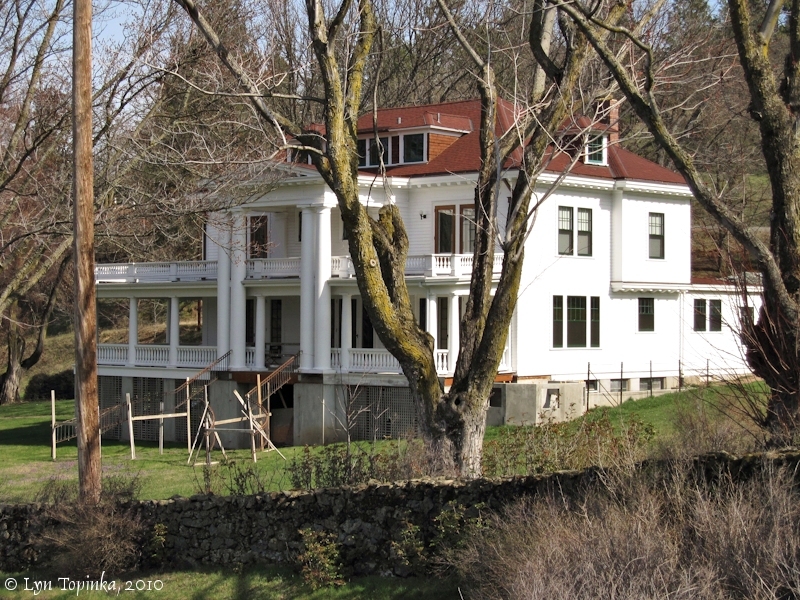 Source: U.S. National Register of Historic Places Mosier House Nomination Form, 1990, #90000286. 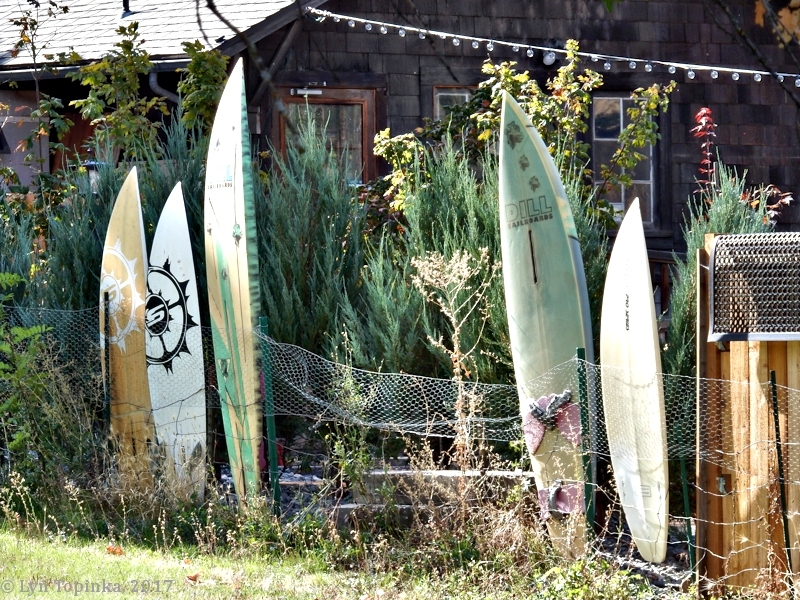 "The town of Mosier, with a population of but 200, has one of the most progressive commercial clubs in the state ... Since the first of the year the club has been instrumental in raising the sum of $1700, which has been used in improving streets and roads and in other public enterprises. The sum of $500 has been raised in the past two months and has been spent on the streets of the city, some of which have been graded, macadamized and oiled, and $370 was raised for the Fourth of July celebration. At the instigation of the club the Mosier citizens are building a public wharf, at which 35 men have been at work. About two miles of highway, known as the Mayerdale road, has been completed just east of the city. It is possible that this macadamized roadway will eventually form a link of the Columbia Highway in Wasco County. 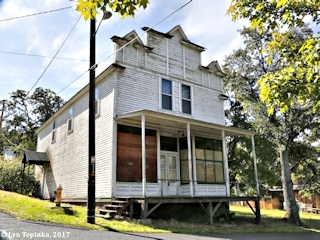 Building, too, is booming in Mosier this Summer. Three new buildings are rising, one of which is a brick structure, the new home of the Mosier Bank." Source: "Sunday Oregonian", August 30, 1914, courtesy Historic Oregon Newspapers Archives, University of Oregon Libraries, 2017. Click image to enlarge Mosier Valley Post Office, Mosier, Oregon. Image taken May 4, 2011. 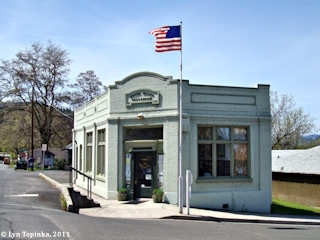 The Mosier Post Office was established in 1884. It first occupied a small building near the railroad depot until it bounced from home to home. In 1929 it moved to its current location, a building which was once Mosier's bank building. 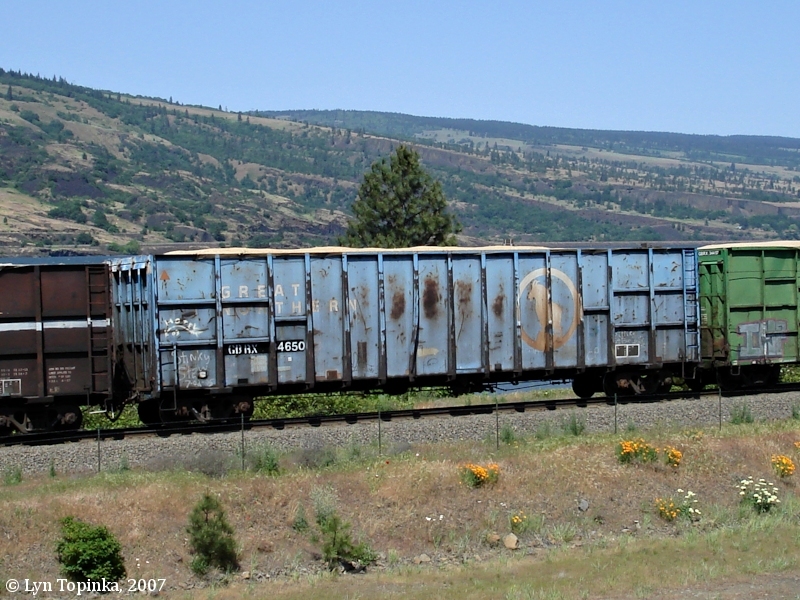 "MOSIER, 118.1 m. (95 alt., 192 pop. 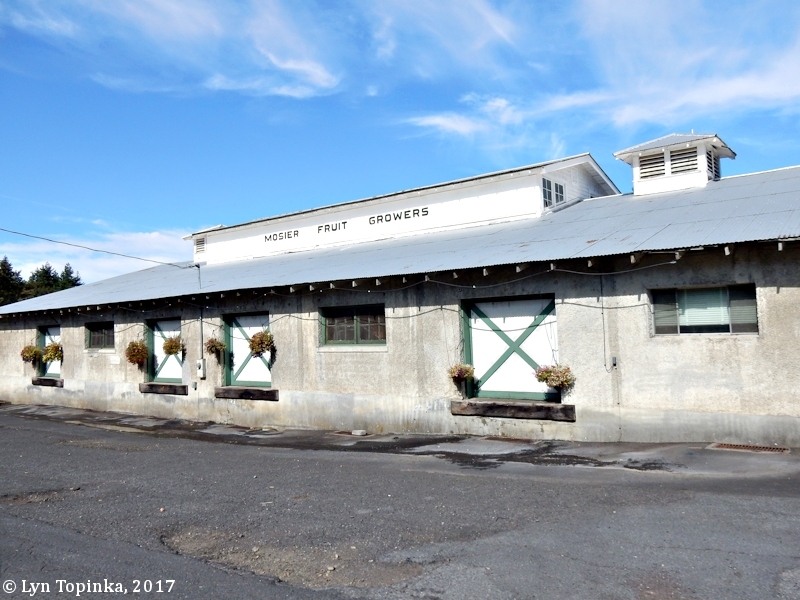 ), at the confluence of Mosier Creek and the Columbia River, is in a small fruit growing section well known for its apple cider. The MOSIER TUNNELS, 119.5 m., one 261 feet and the other 60 feet long, often referred to as the Twin Tunnels, penetrate a promontory more than 250 feet above the river. West of this point the contrast between the barren, semi desert contours of eastern Oregon and the lushness of the Pacific Slope becomes apparent. " 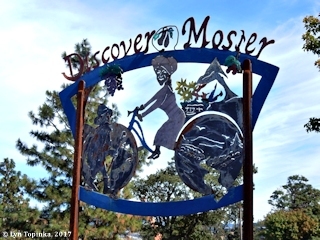 Click image to enlarge Metal "Discover Mosier" sign, Mosier, Oregon. Image taken October 4, 2017. 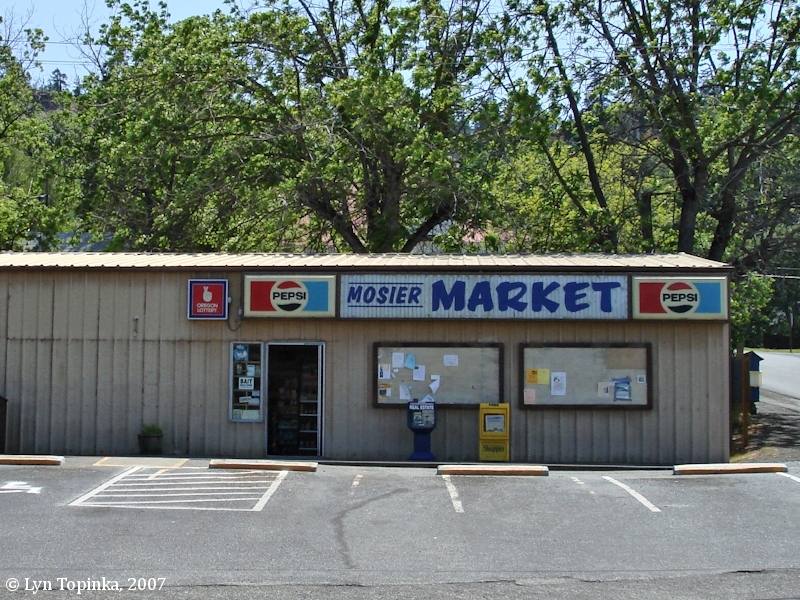 Click image to enlarge Mosier Market, Mosier, Oregon. Image taken May 13, 2007. 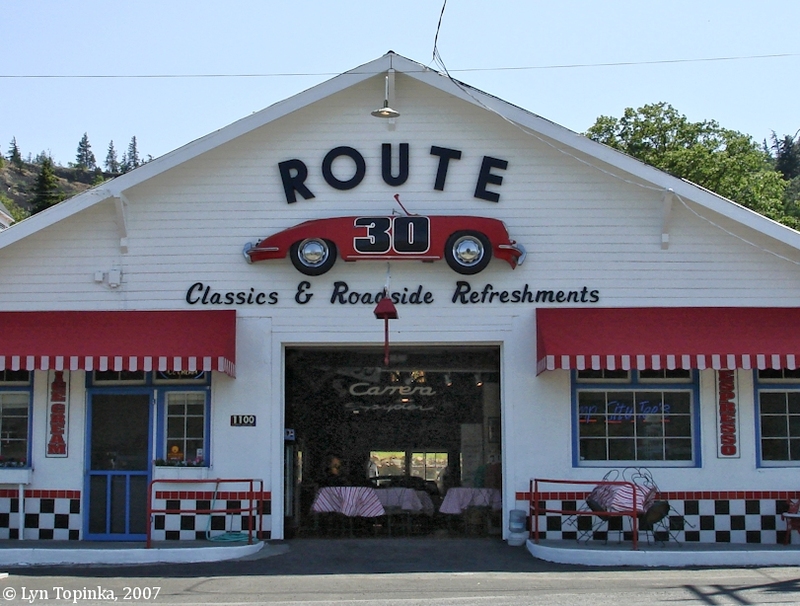 Click image to enlarge Route 30 Classics and Roadside Refreshments, Mosier, Oregon. Image taken May 13, 2007. 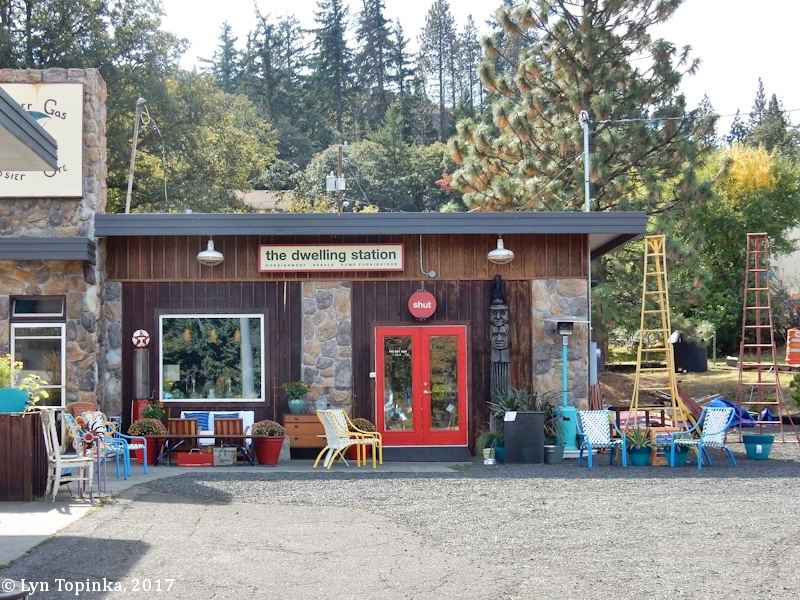 Click image to enlarge "The Dwelling Station", Mosier, Oregon. Image taken October 4, 2017. 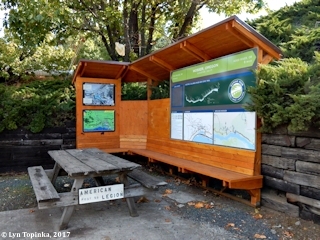 Click image to enlarge Picnic area, Mosier, Oregon. Image taken October 4, 2017. 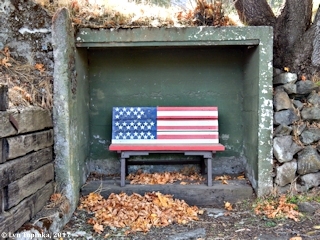 Click image to enlarge Flag bench, Mosier, Oregon. Image taken October 4, 2017. 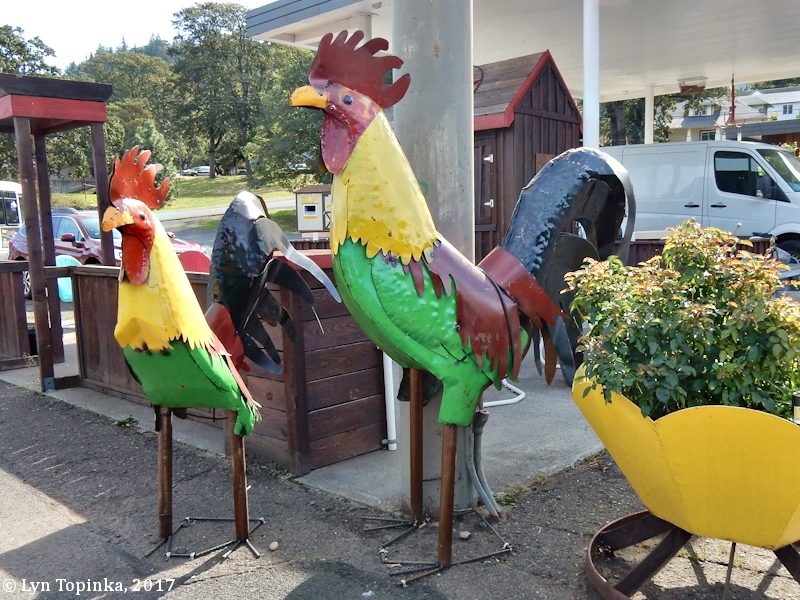 Click image to enlarge Roosters, Mosier, Oregon. Image taken October 4, 2017. 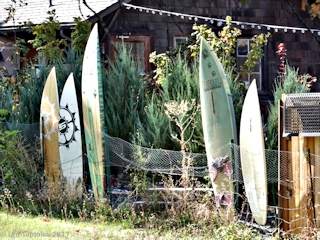 Click image to enlarge Surfboards, Mosier, Oregon. Image taken October 4, 2017. 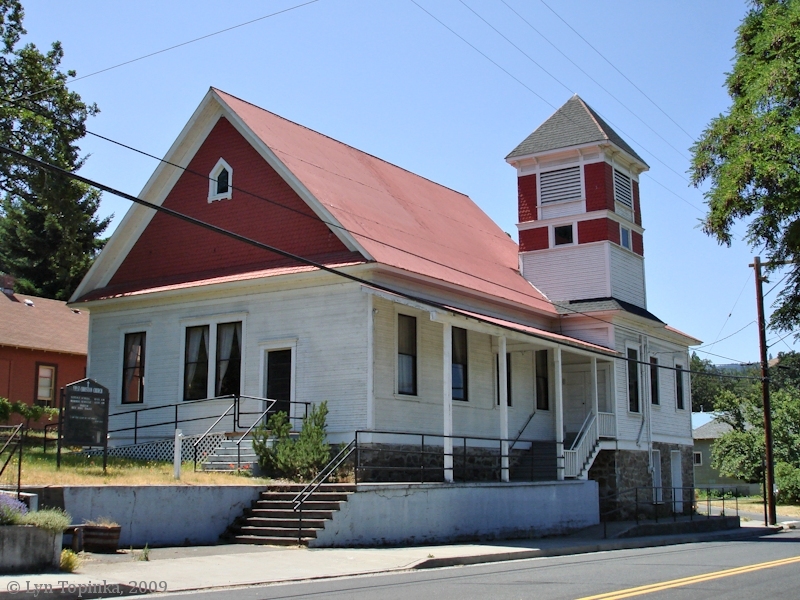 Mosier's First Christian Church was dedicated October 31, 1909. Click image to enlarge First Christian Church, Mosier, Oregon. Image taken June 27, 2009. 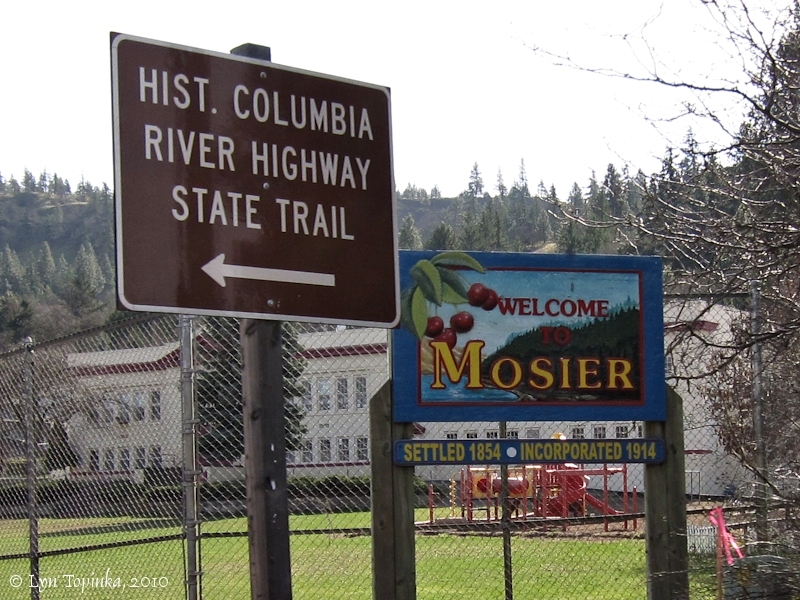 Two Historic Columbia River Highway bridges are in Mosier. 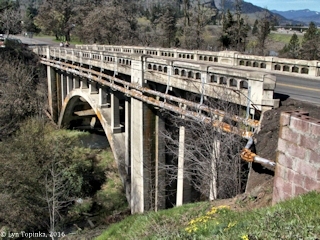 The 45-foot-long Rock Creek Bridge is located just west of town and the 182-foot-long Mosier Creek Bridge is located just east of town. Rock Creek Bridge was built in 1918 and renovated in 1996. 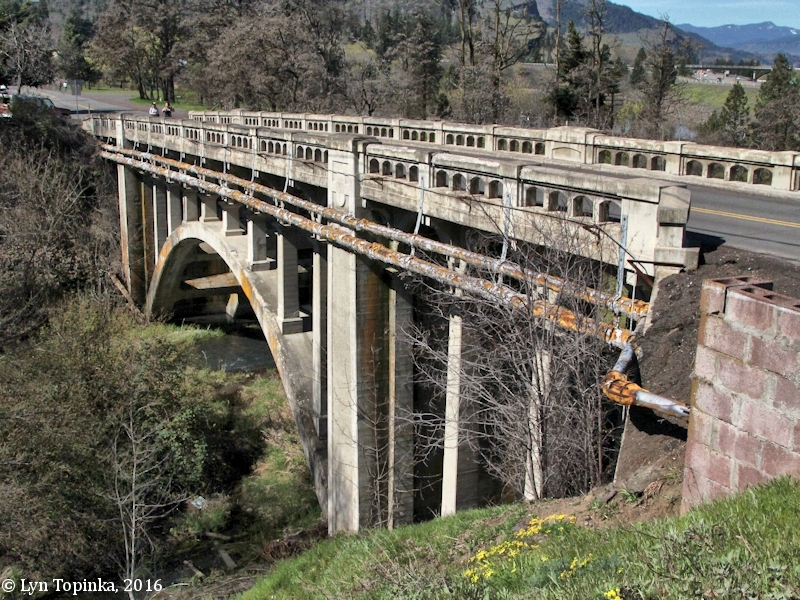 Mosier Creek Bridge was built in 1920. 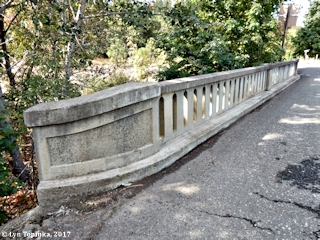 Click image to enlarge HCRH, Rock Creek Bridge, looking east, Mosier, Oregon. Image taken October 4, 2017. Click image to enlarge HCRH, Rock Creek Bridge, upstream side, Mosier, Oregon. Image taken October 4, 2017. 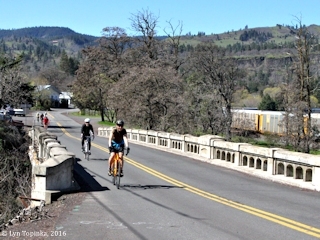 Click image to enlarge Mosier Creek Bridge, Mosier, Oregon. Looking west. Image taken March 30, 2016. Click image to enlarge Mosier Creek Bridge, Mosier, Oregon. Image taken March 30, 2016. Death of Hon. J.H. Mosier. "At Mosier, Friday afternoon Oct. 5th, 1894, at 1:15 Jonah Harrison Mosier, aged 73 years 6 months and 25 days. Funeral in Mosier cemetery Monday morning at 10 o'clock under the direction of the Masonic Fraternity. Later he left California for his former home in Missouri, but like all others who have had a taste of western life, he soon tired of his old surroundings, and in 1853 bade farewell forever to Missouri, removing directly to The Dalles, Oregon. He, with Col. Gates and Judge Laughlin (father of Frank J. Laughlin) first platted the city of The Dalles. Soon thereafter Mr. Mosier was again busy with his hammer and saw and built the first business houses of the city. In the spring of 1855 he settled at Mosier, where he has resided ever since. His pursuits since then were varied. In 1855 he erected a sawmill, which is believed to have been the first operated in Wasco county. He also drove cattle to the mines, and himself owned large bands. He had an occasional brush with Indians, and on one occasion nearly met his death while rowing a large sail boat up the river during a comparative calm. ... More than once Mr. Mosier, with his family, has been compelled to temporarily abandon his place in the night, being threatened by predatory Indians. But though courageous and resolute, he never retaliated in kind, depending more upon kindheartedness and inoffensive conduct toward his copper-hued bretheren than the modern weapons of offense and defense. In 1876 Mr. Mosier served the state with dignity and honor in the legislature. Mr. Moser has been quite ill since the latter part of June ... The creek he settled and the town he located justly bear the name of its locally illustrious founder, all now given to history and memory in minds of men. He professed religion a short time before his death, and sustained by its consolations and an indomitable will, he bore his sufferings uncomplainingly to the end." Source: "The Dalles Daily Chronicle, October 6, 1894, courtesy Historic Oregon Newspapers Archives, University or Oregon Libraries, 2016. 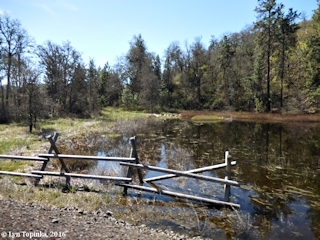 Marsh Cutoff Road is approximately four miles east of Mosier and is reached from the Historic Columbia River Highway. 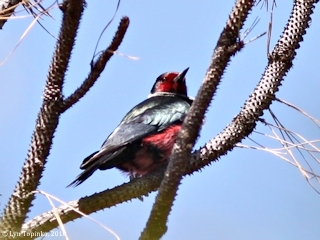 The road is lined with fields, marshes, and oak groves and is a wonderful place to look for Lewis's Woodpeckers, Western Bluebirds, and Western Meadowlarks. 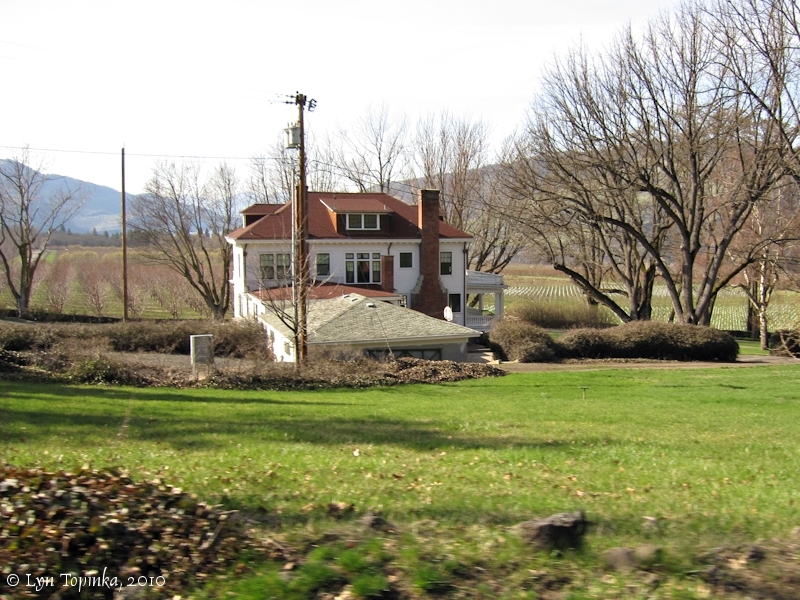 Click image to enlarge Scenic, Marsh Cuttoff Road, near Historic Columbia River Highway Milepost Marker 77, Oregon. Image taken March 30, 2016. Click image to enlarge Lewis's Woodpecker, Marsh Cutoff Road, Mosier, Oregon. Image taken April 25, 2010. "... In 1910 Mark Mayer established a home and a 230 acre apple orchard in Mosier. His home was a stately masion known as Mayerdale Place. In addition he also donated to Wasco county that the land that is now known as Mayer State Park, near Rowena, on the Columbia River. 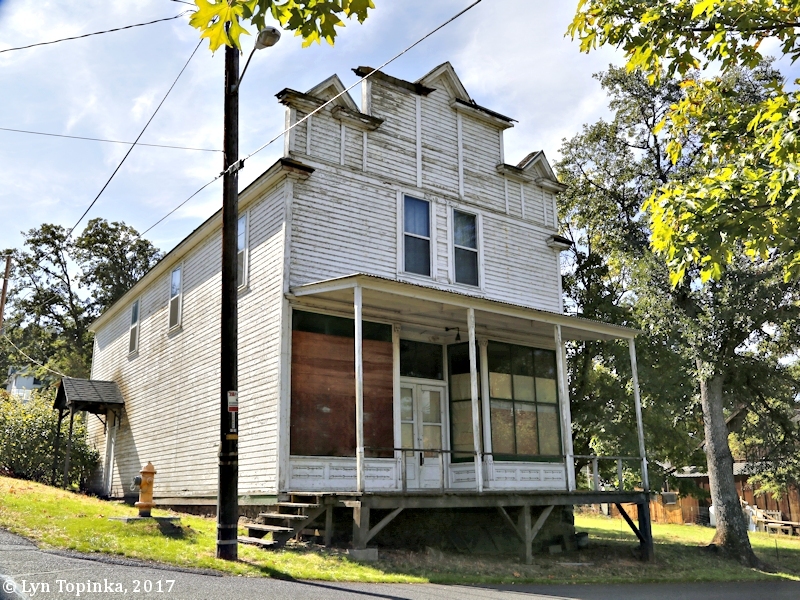 ..."
Click image to enlarge Mayerdale Place, view from the east, Mosier, Oregon. Note apple orchard in the background. Image taken March 6, 2010. 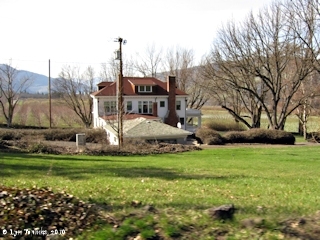 Click image to enlarge Mayerdale Place, view from the southwest, Mosier, Oregon. Image taken March 6, 2010. 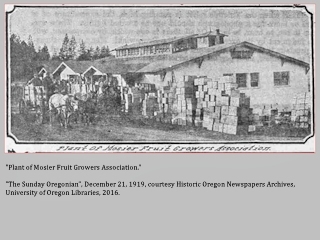 The Mosier Valley Growers Association was organized in 1907. Their all-purpose building was built in 1920. 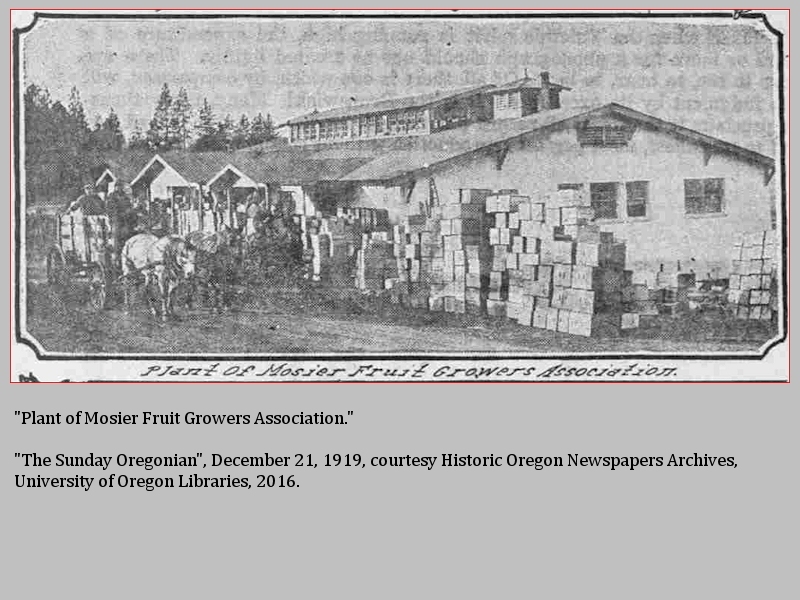 Click image to enlarge HISTORICAL Newspaper image, Mosier Fruit Growers Association Building, Mosier, Oregon. Image from Sunday Oregonian, December 21, 1919, courtesy Historic Oregon Newspaper Archives, University of Oregon Libraries, 2016. 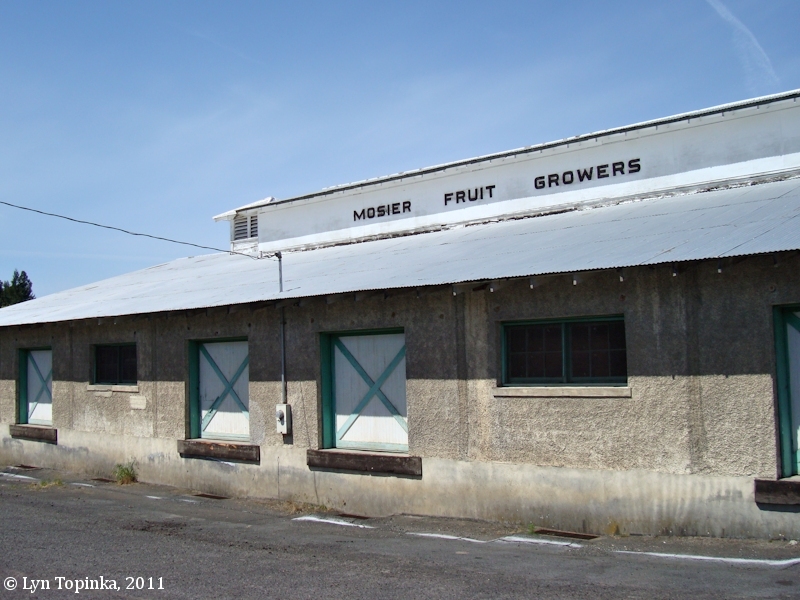 Click image to enlarge Mosier Fruit Growers building, Mosier, Oregon. Image taken May 4, 2011. 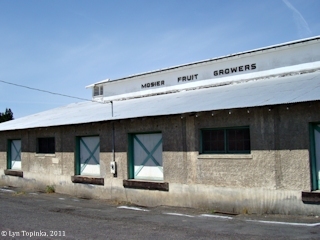 Click image to enlarge Mosier Fruit Growers building, Mosier, Oregon. Image taken October 4, 2017. 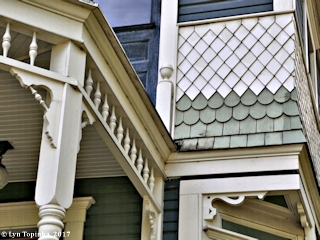 Construction on The "Mosier House" began in 1896 and was completed in 1904. 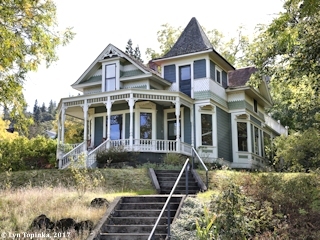 Built by Jefferson Mosier, the founder of the community of Mosier, the house is the last remnant of Queen Anne style of architecture in the Mosier community. 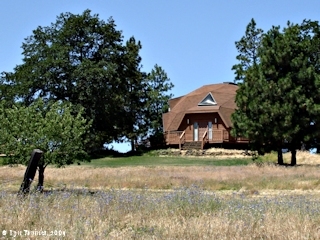 In 1990 the "Mosier, Jefferson, House" was listed on the U.S. National Register of Historic Places (Building, #90000286). Click image to enlarge Mosier House, Mosier, Oregon. Image taken October 4, 2017. 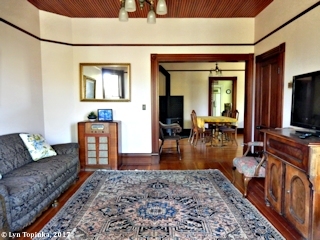 Click image to enlarge Living Room, Mosier House, Mosier, Oregon. Image taken October 4, 2017. 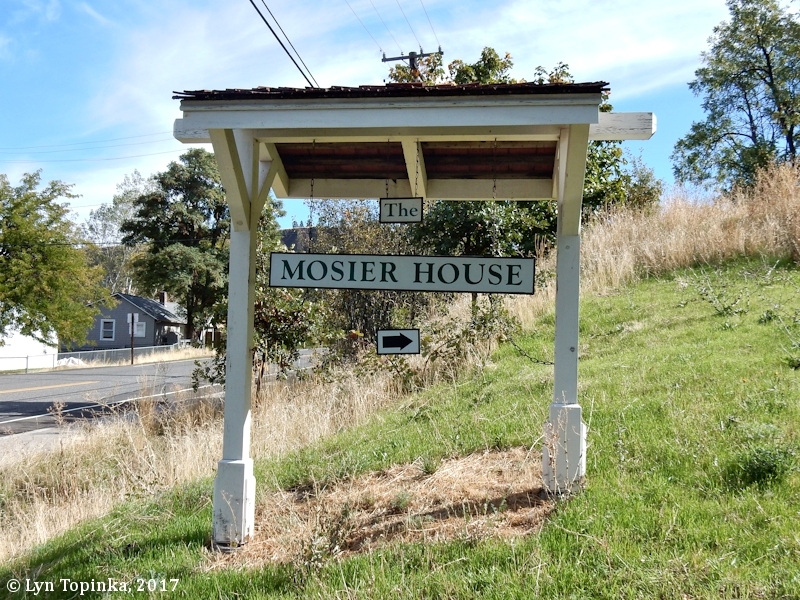 "Residents of Mosier have always welcomed travelers -- even as far back as 1854, when Jonah H. Mosier settled here on a donation land claim. Mosier, a cabinetmaker by trade, had made the rugged trip west twice -- to California in 1849, and again to Oregon in 1853. Mosier and his wife operated an impromptu stage station, catering to the hundreds of Oregon Trail emigrants who streamed down the Gorge on their way to the Willamette Valley. The railroad arrived in 1882 and sparked a real estate boom as settlers, drawn by the case of transportation and by reports of idea apple-growing conditions, queued up to purchase land. As it turned out, cherries were far more suitable for the area's soil -- but it would take many years for growers to realize this -- and even more years for them to switch crops. 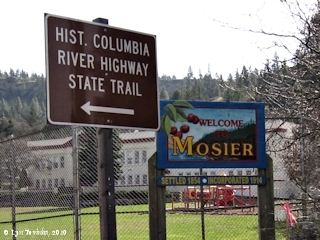 Mosier got another infusion of industry with the arrival of the Columbia River Highway in 1921. 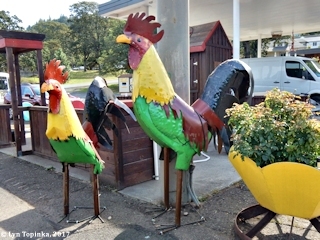 Roadhouses, restaurants, and service stations lined the scenic road where it passed through town, and the hills echoed with the sputter and cough of touring cars on their way to or from The Dalles." 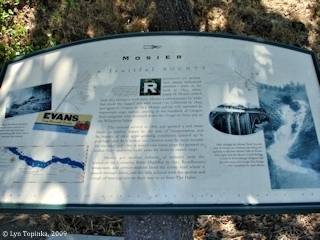 Source: Mosier information sign, Mosier, Oregon, visited June 2009. 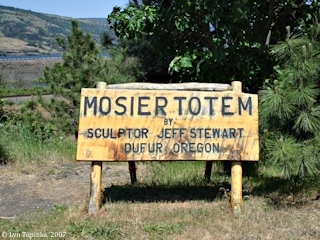 Click image to enlarge Information sign, Mosier, Oregon. Image taken June 27, 2009. Turn north off HWY 30 east of the totem pole at the CITY PARKING sign. Park between HWY 30 and the rail road. Walk 1/4 mile east on HWY 30 to cross to the trail head on the south side of the road. 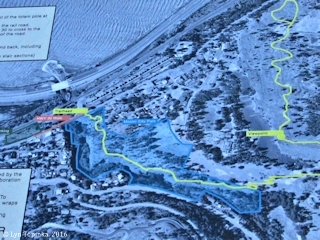 Trail Length: 3.5 miles out and back, including the HWY 30 walk. 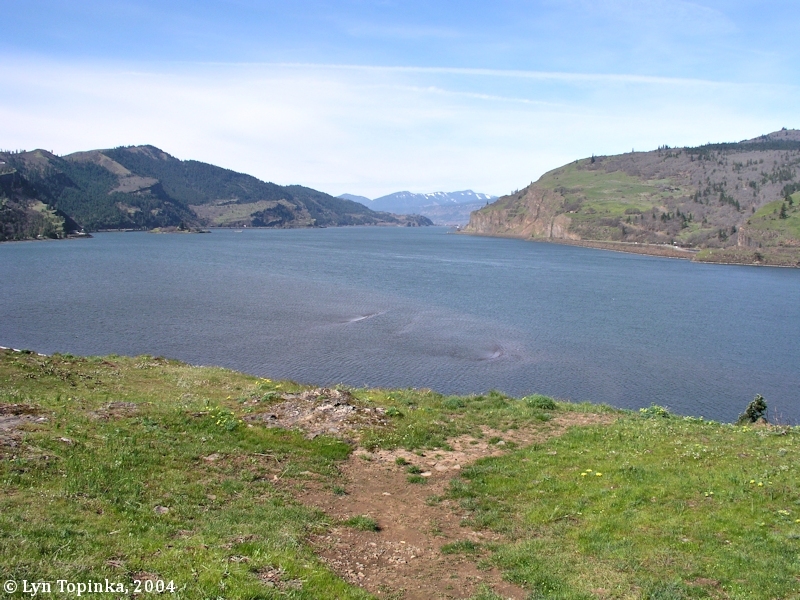 The Mosier Plateau Trail was developed by the Frineds of the Columbia Gorge in collaboration with the City of Mosier. This trail is the first of the Gorge Towns To Trails, a comprehensive trail system that wraps around the Columbia Gorge, linking communities with recreation and enhancing community downtown vitality. Source: Information Sign, Mosier, Oregon, visited March 2016. Click image to enlarge Sign, Mosier Plateau Trail, Mosier, Oregon. Image taken March 30, 2016. 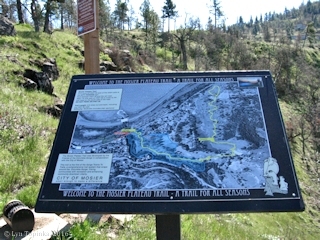 Click image to enlarge Sign detail, Mosier Plateau Trail, Mosier, Oregon. Image taken March 30, 2016. The Mosier Syncline is the lowpoint between the Bingen Anticline to the west, and the Ortley Anticline to the east. 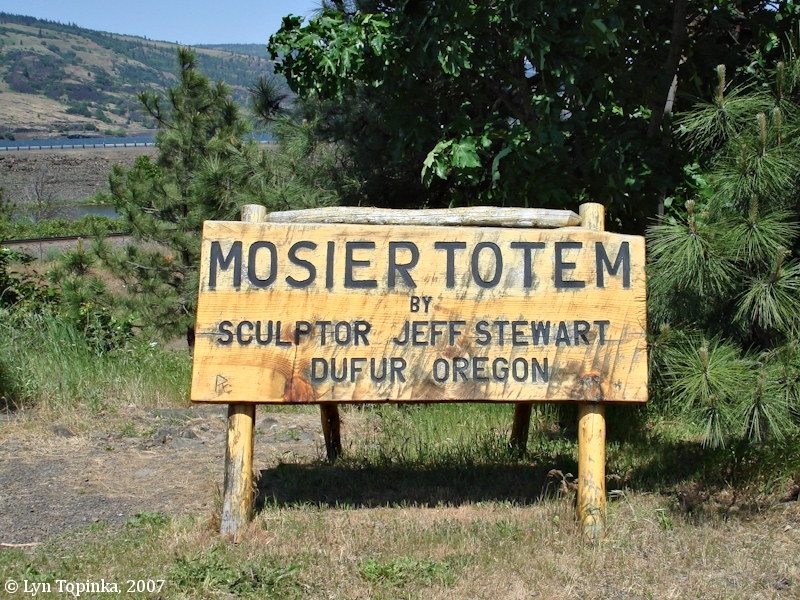 The Mosier Totem was carved by Jeff Stewart of Dufur, Oregon. The building of the Mosier Trading Company was one of the first buildings in downtown Mosier. 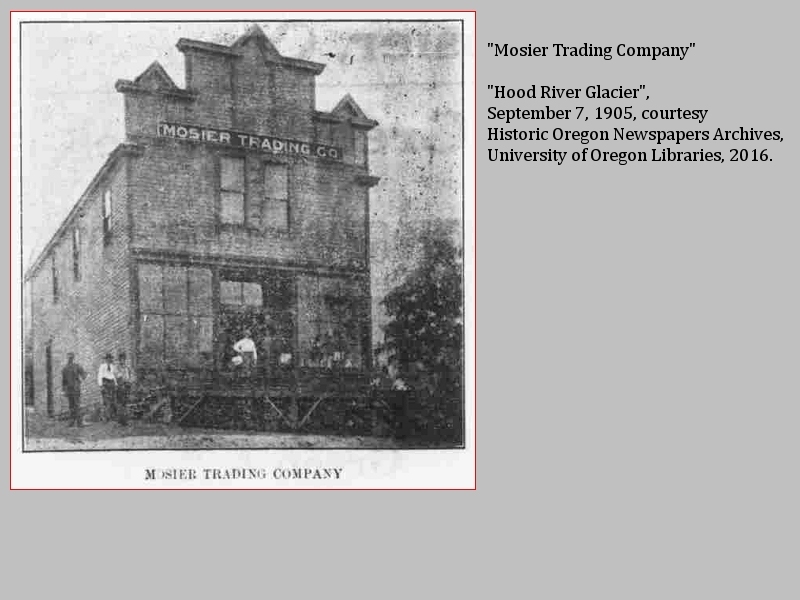 Click image to enlarge HISTORICAL Newspaper image, Mosier Trading Company, Mosier, Oregon. Image from Hood River Glacier, September 7, 1905, courtesy Historic Oregon Newspaper Archives, University of Oregon Libraries, 2016. 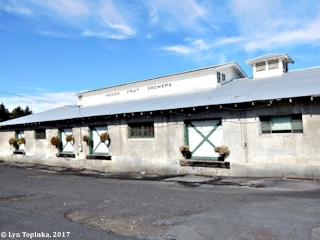 Click image to enlarge Mosier Trading Company building, Mosier, Oregon. Image taken October 4, 2017. 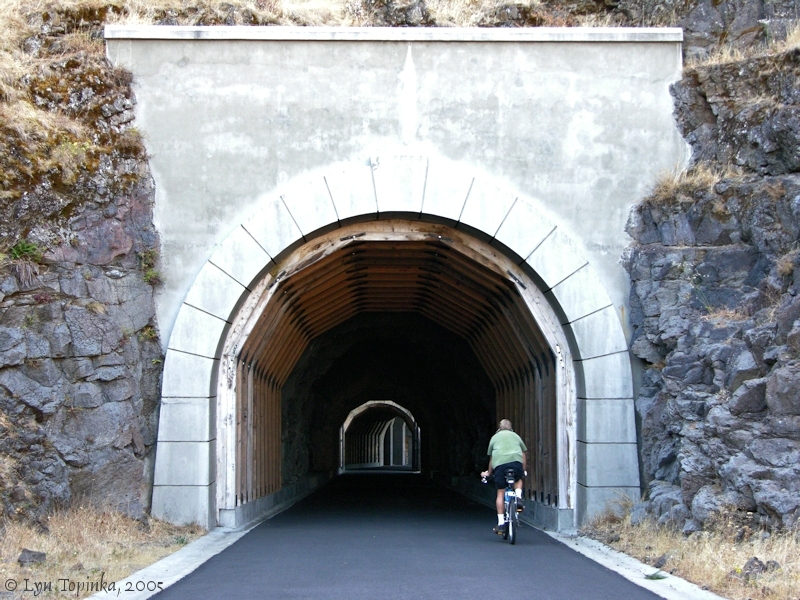 The "Twin Tunnels" of Mosier were once part of the Historic Columbia River Highway and are now part of Oregon's Historic Columbia River Highway State Trail. Click image to enlarge East Portal, Mosier Tunnels. Image taken September 18, 2005. 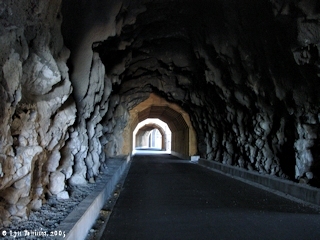 Click image to enlarge East Portal, Mosier Twin Tunnels. Image taken September 18, 2005. The Mosier Valley Bank was organized in 1909. It moved into a stately new brick building in 1914, today the location of the Mosier Valley Post Office. 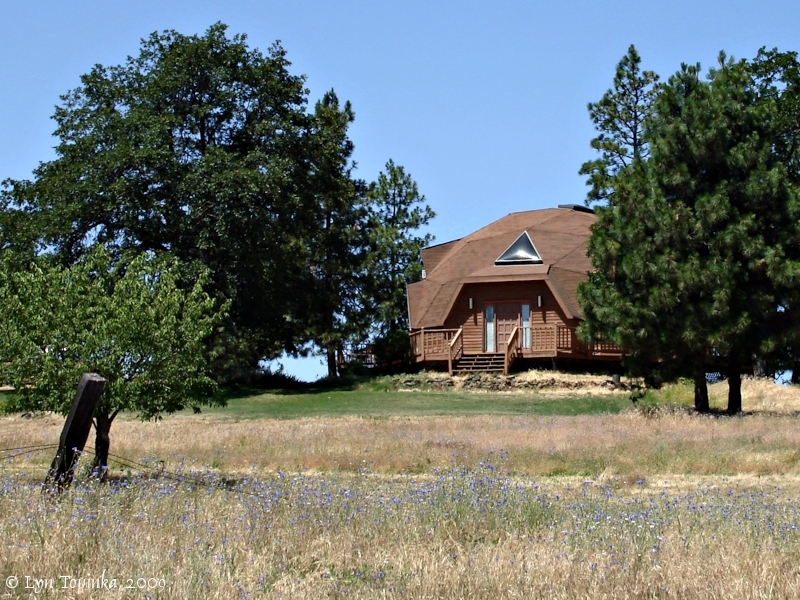 Click image to enlarge "Octagonal House", Mosier, Oregon. Historic Columbia River Highway, Mosier to Rowena. Image taken June 27, 2009. 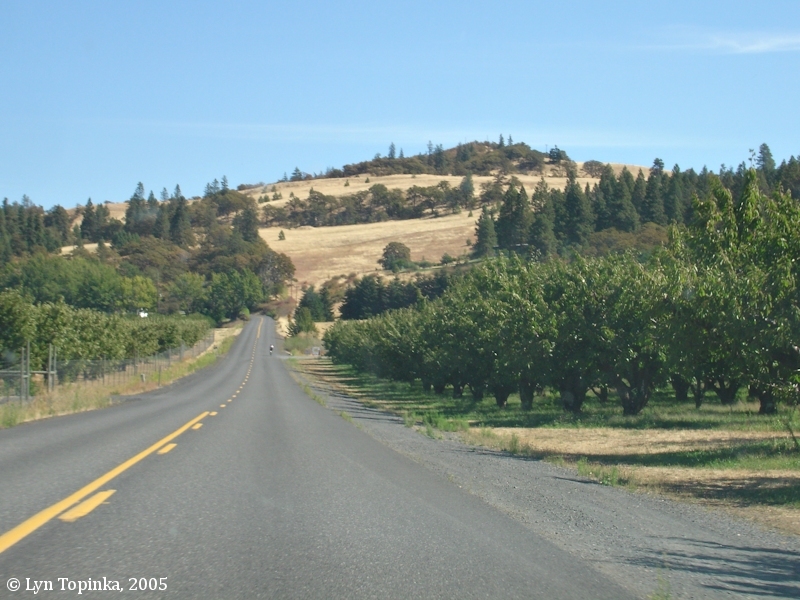 "Regular rows of fruit trees extend on either side of the highway [Historic Columbia River Highway], giving the subsection a rural, agricultural look. 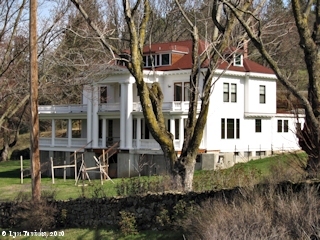 This subsection is climaxed by a glimpse of the large Mayerdale house, the site of one of the dedication ceremonies for the HCRH. 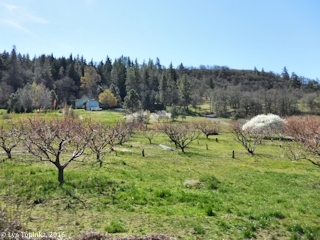 A new deer fence detracts from the view of the orchards." Source: HCRH Master Plan, 2005. Click image to enlarge Orchards near Mosier, Historica Columbia River Highway, Oregon. Image taken March 30, 2016. 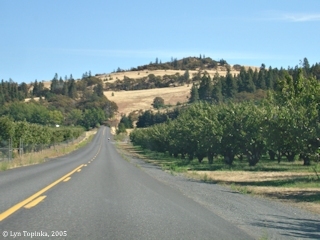 Click image to enlarge Orchards along the Historic Columbia River Highway, east of Mosier, Oregon. Image taken September 18, 2005. 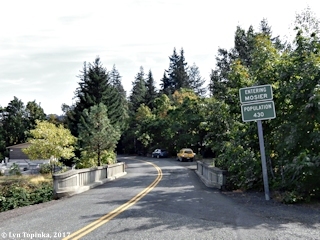 "The Mosier Pioneer Cemetery Is historically significant on a local level for its association with the founders of Mosier, the Jane and Jonah Mosier family. 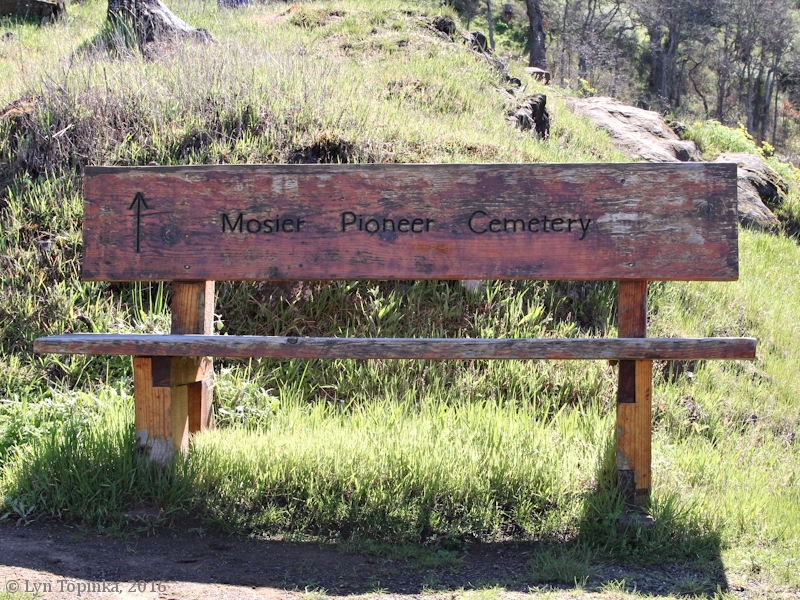 Many of the family members and close friends are interred in the Mosier Pioneer Cemetery, and represent some of the earliest Euro-American burials in the Mosier area. The first known burial (1865) was that of Jane Mosier, the wife of Jonah Mosier who established the original donation land claim in the area. The historic period of significance is from 1865 to 1901. The beginning date signifies the first known burial and the end date corresponds to the last recorded historic burial." Click image to enlarge Mosier Pioneer Cemetery bench, Mosier, Oregon. Image taken March 30, 2016. 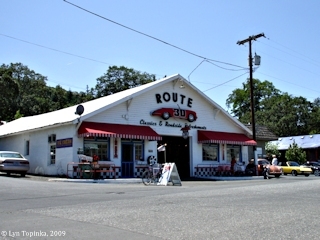 "Route 30 Classics, Vintage Porsches & Parts" was established in 1985 and is "the" place for Porsche enthusiasts. 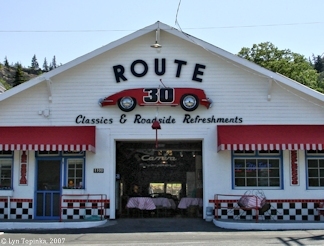 The "Route 30 Roadside Refreshments" is located in the same building and serves 16 flavors (2017) of ice cream !!! Click image to enlarge "Route 30" Classics and Roadside Refreshments, Mosier, Oregon. Image taken June 27, 2009. 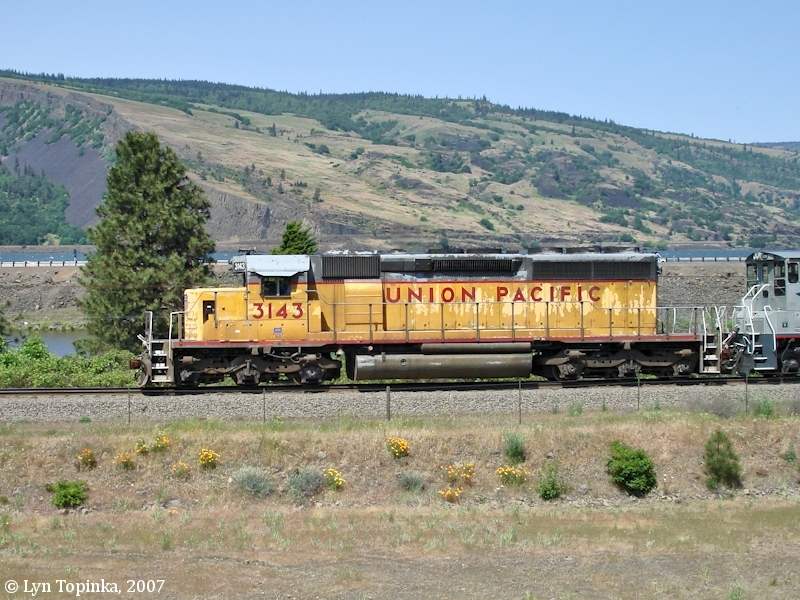 Click image to enlarge Union Pacific 3143, Mosier, Oregon. 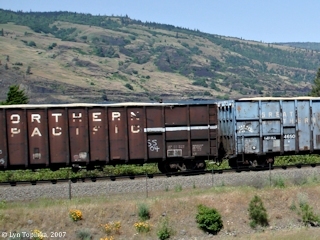 Union Pacific train passing Mosier, Oregon. Image taken May 13, 2007. 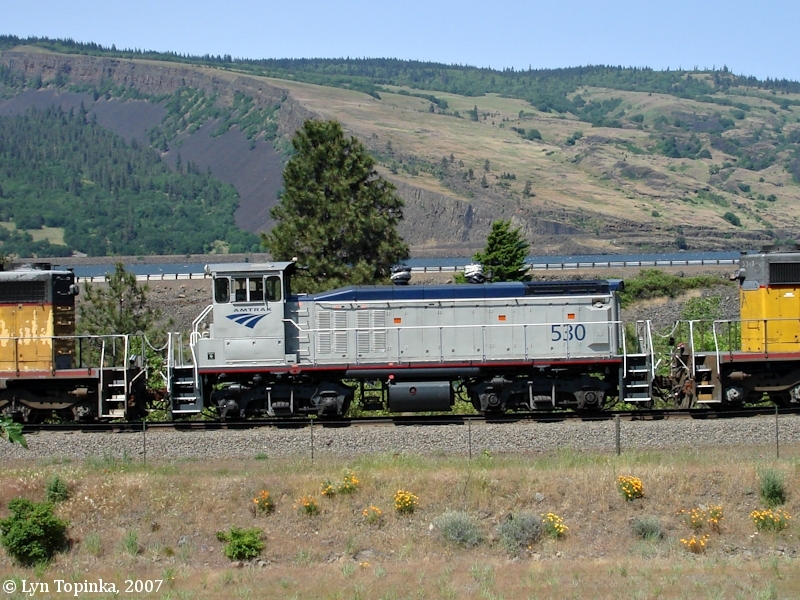 Click image to enlarge Amtrak Yard Switcher 530, Mosier, Oregon. Image taken May 13, 2007. 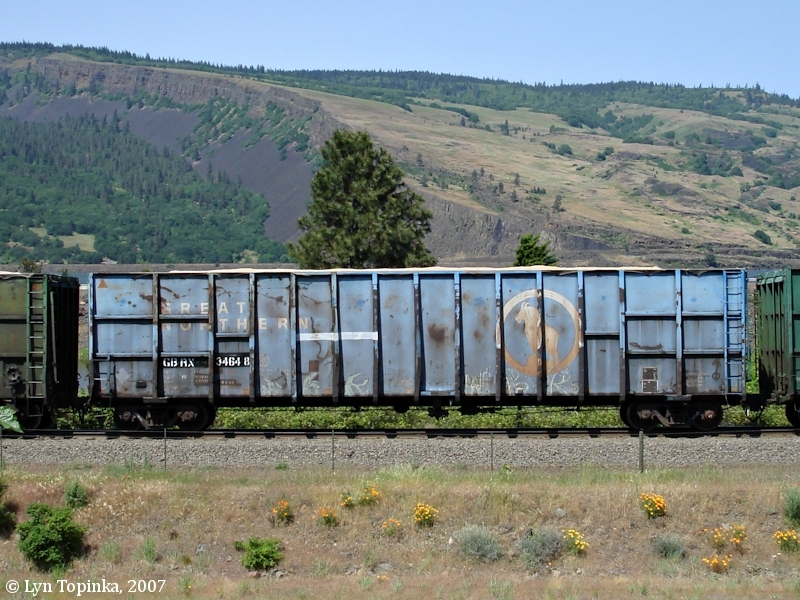 Click image to enlarge Ex-Great Northern wood chip hopper now owned by Greenbrier Companies, GBRX 34648. Big Sky Blue paint. 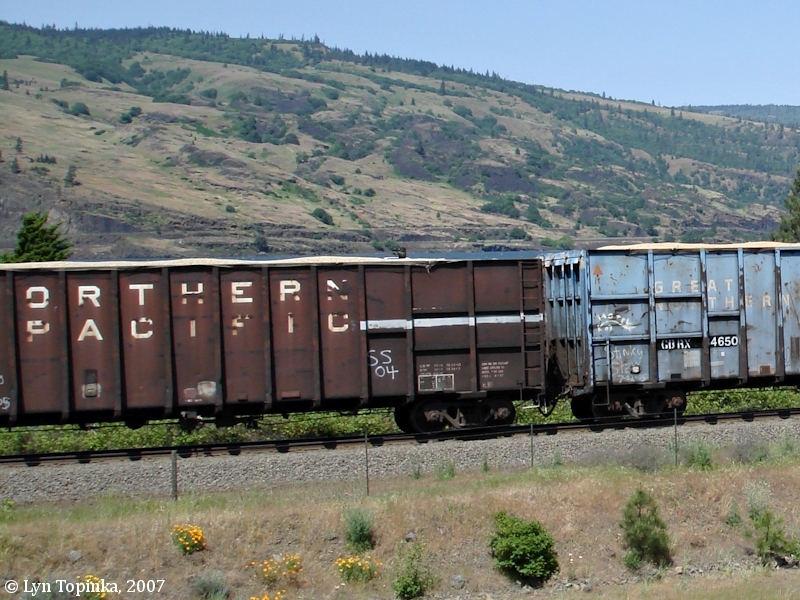 Union Pacific train passing Mosier, Oregon. Image taken May 13, 2007. Click image to enlarge Ex-Great Northern wood chip hopper now owned by Greenbrier Companies, GBRX 34650. Big Sky Blue paint. 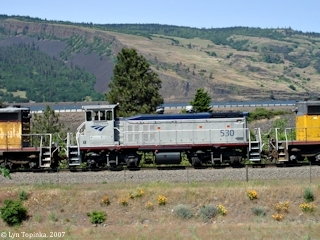 Union Pacific train passing Mosier, Oregon. Image taken May 13, 2007. 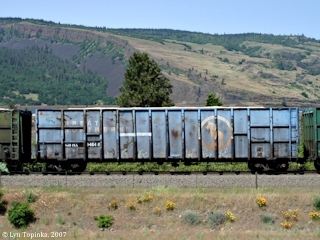 Click image to enlarge Northern Pacific wood chips car. 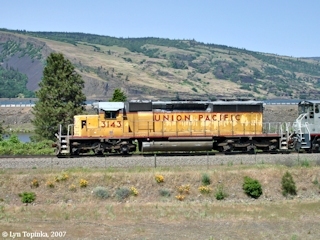 Union Pacific train passing Mosier, Oregon. Blue boxcar behind is a Great Northern boxcar (see above). Image taken May 13, 2007.